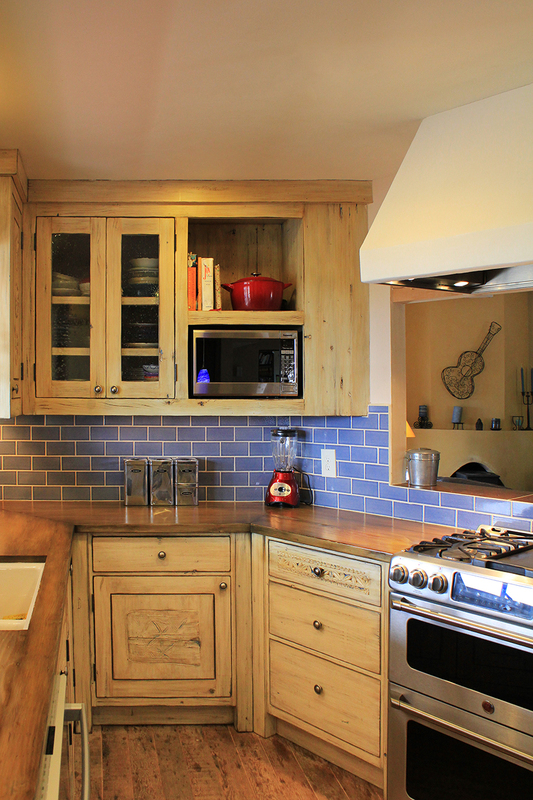 A cozy Santa Fe kitchen gets an update with custom cabinetry and a remodel that creates space, light and connection with the rest of the house. Our clients came to us wanting to remodel the kitchen in their Santa Fe home. The kitchen was small, triangular in shape, in the front corner of the home and cut off from the rest of the house [Fig. 1a]. 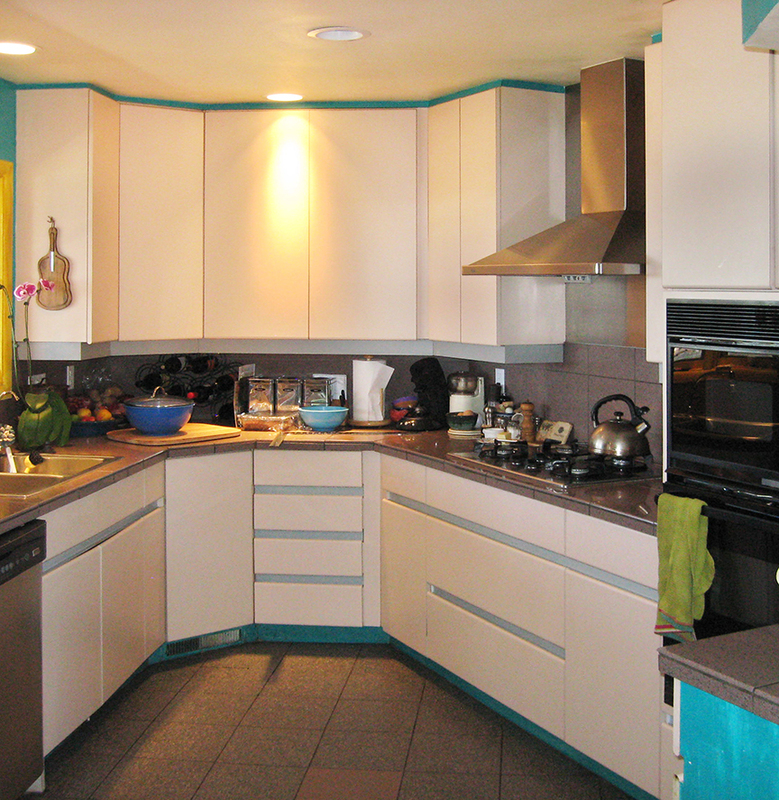 While keeping the same space, they wanted to open up and lighten the room, to improve the flow, increase work surface and customize the cabinets and drawers to maximize storage. 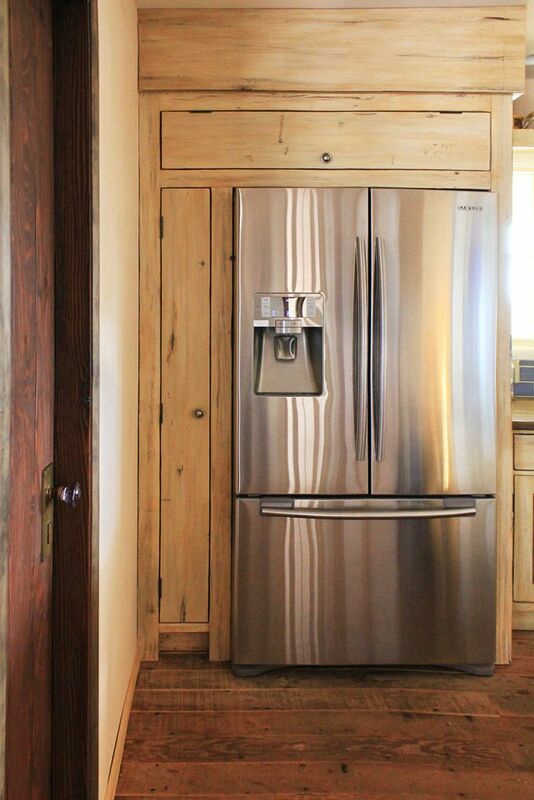 To achieve these goals, the refrigerator was moved to the left and one of two windows moved to the right of the fridge. 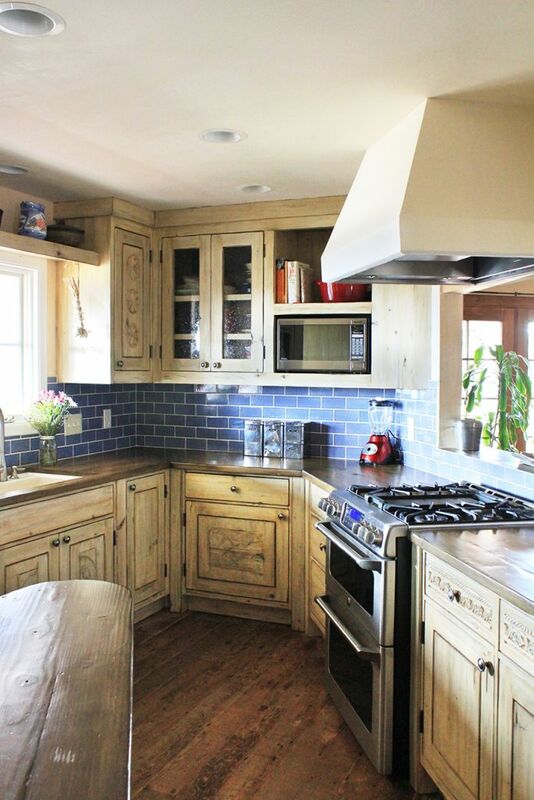 On the opposite wall a cooktop and wall oven were combined into a traditional range, with an opening to the living room cut into the wall to the left of the range. With windows to the front yard on one side and a window into the next room on the other, the previously confined space opened up significantly [Fig. 1b]. They also added a walk-in pantry, which freed up a lot of cabinet space. 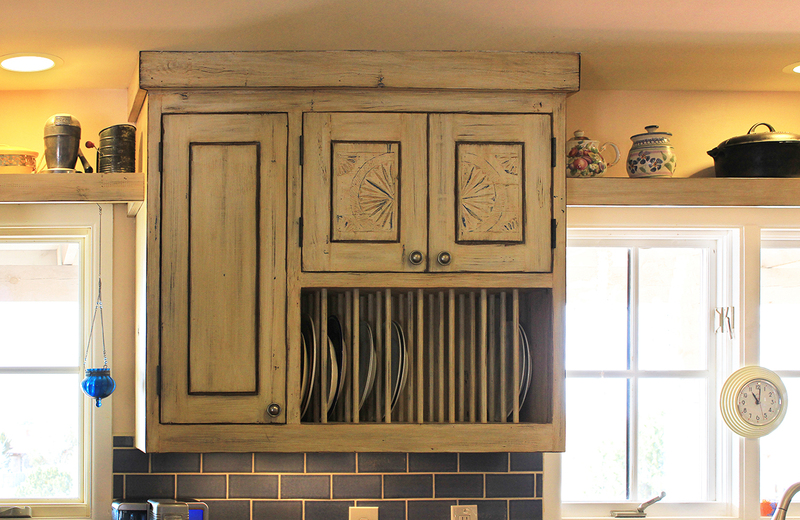 While they wanted modern functionality, such as self-closing drawers and pull-out shelving, our clients wanted the look to be eclectic, with an Old World, antique feel. 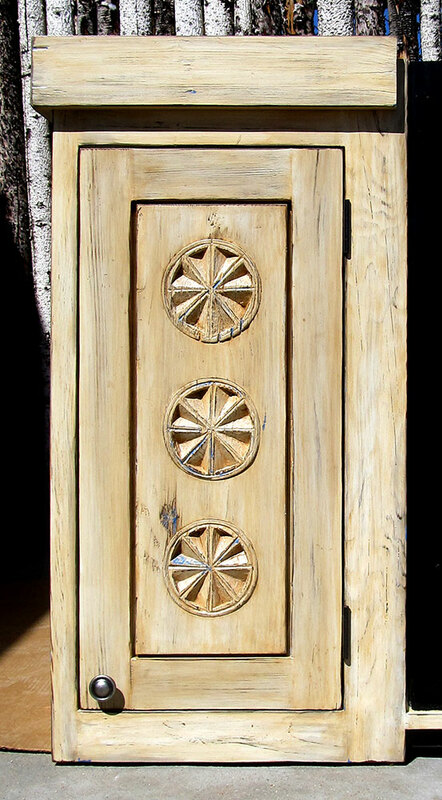 Inset antique carved panels and a multilayered patina achieved the effect. 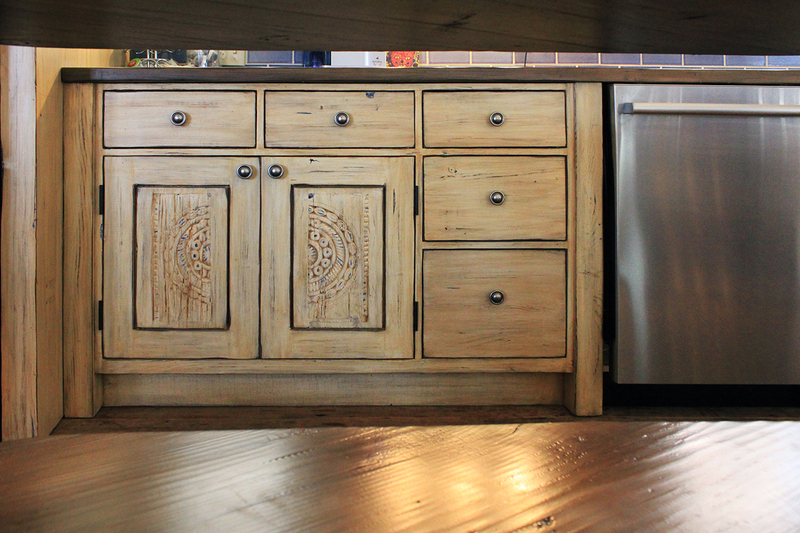 Scott drew the cabinets and helped the clients pick the antique material to embellish them [Figs. 2a-2b]. 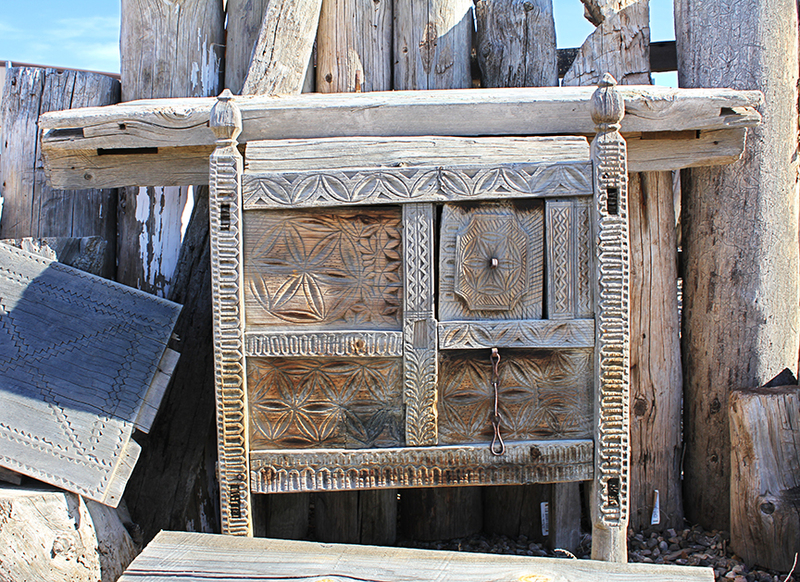 There is a mix of geometric and floral motifs, with panels coming from antique door surrounds, cabinets and dowry chests. 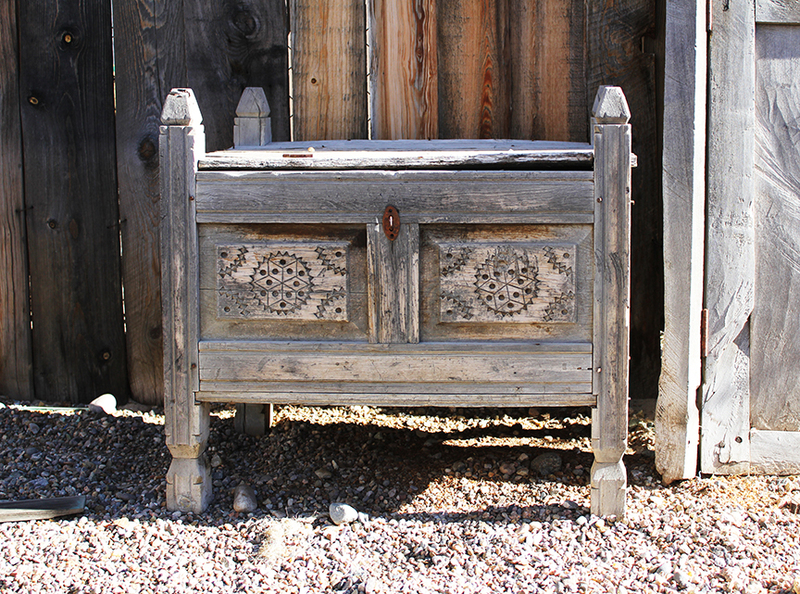 Antique dowry chests are a rich source of carved material of an incredible variety. 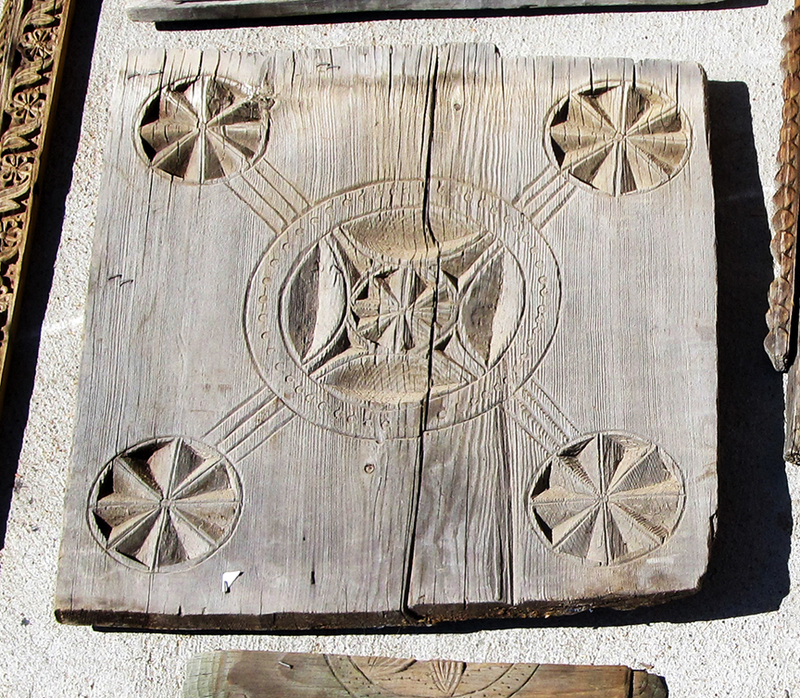 Traditionally they are ornately decorated as a status symbol. 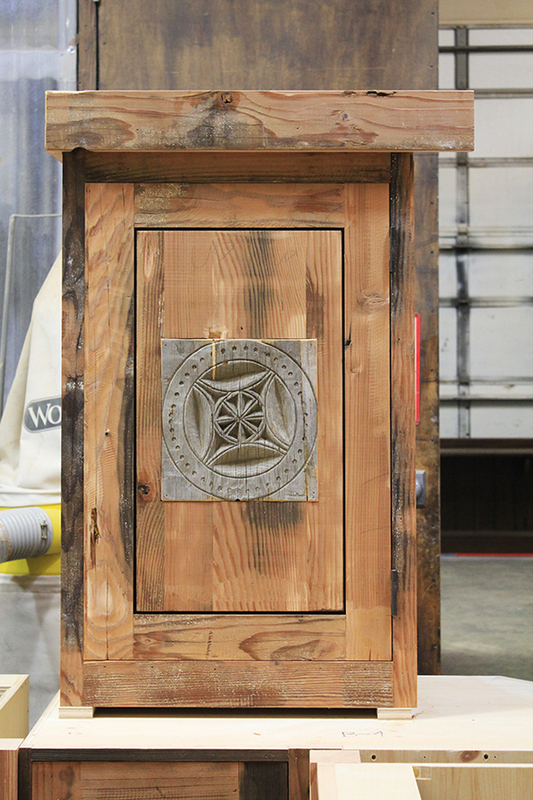 The houses are usually sparsely furnished, and the chest is featured as a special piece, but also a practical piece of furniture. The tops, while they can be rounded, are usually flat, so as to serve as a seat. The wood pieces are joined, not nailed. We show two here [Figs. 3a-3b], from the Swat Valley in Northern Pakistan as an example. Some dowry chests are quite large, others more modest. Some feature deep, confident carving, others more timid shallow cuts. 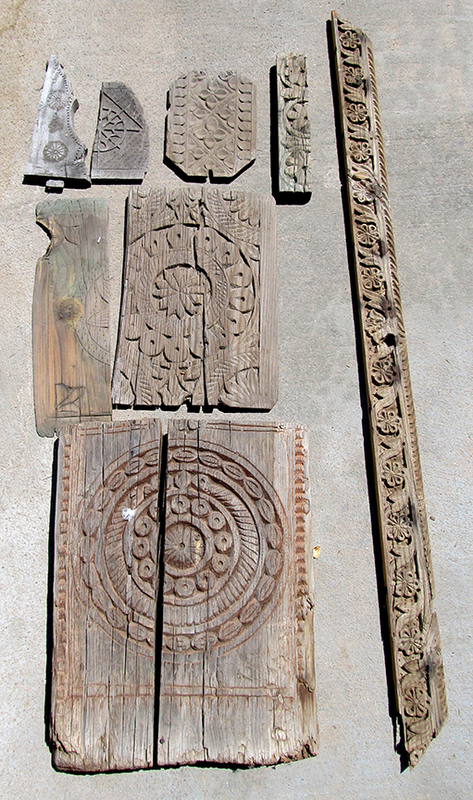 Often the legs are heavily carved with leaves and flowers or repeating patterns. 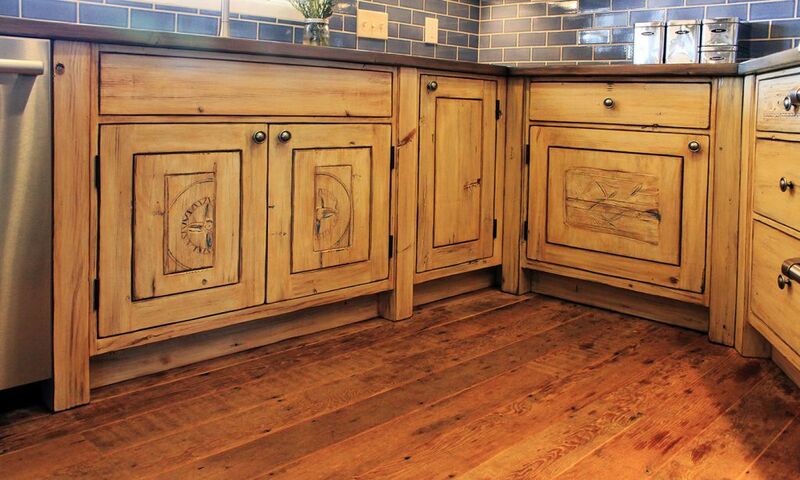 We use the legs and dividing bars to embellish kitchen and bath cabinet legs and drawer fronts, the finials are often used as cabinet feet, and the panels adorn cabinet doors. 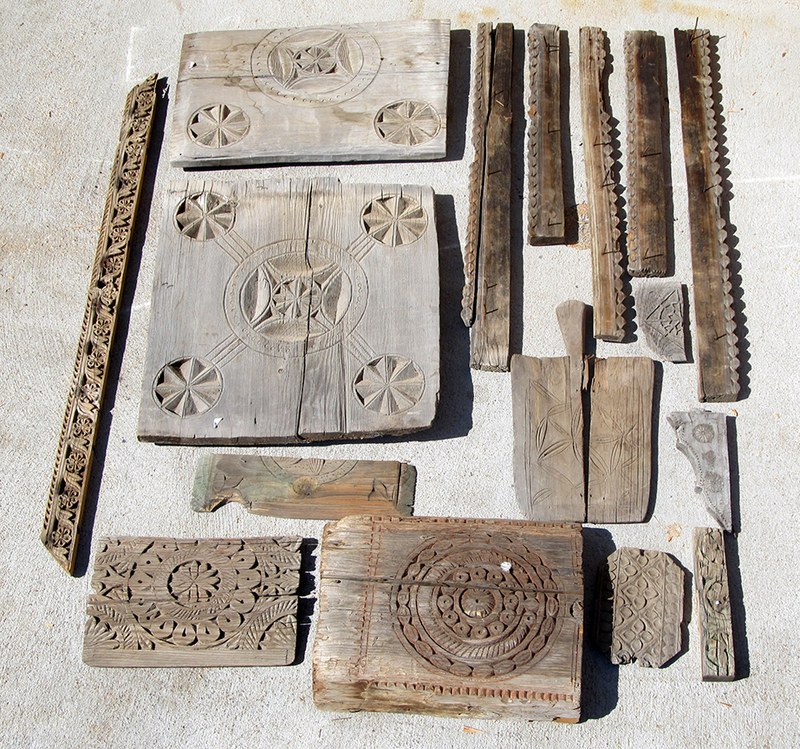 These elements serve not only to adorn the cabinetry, but also bring a sense of history. We love working in collaboration with our clients, the end result being a product unique to them, with the richness of a story behind each piece. 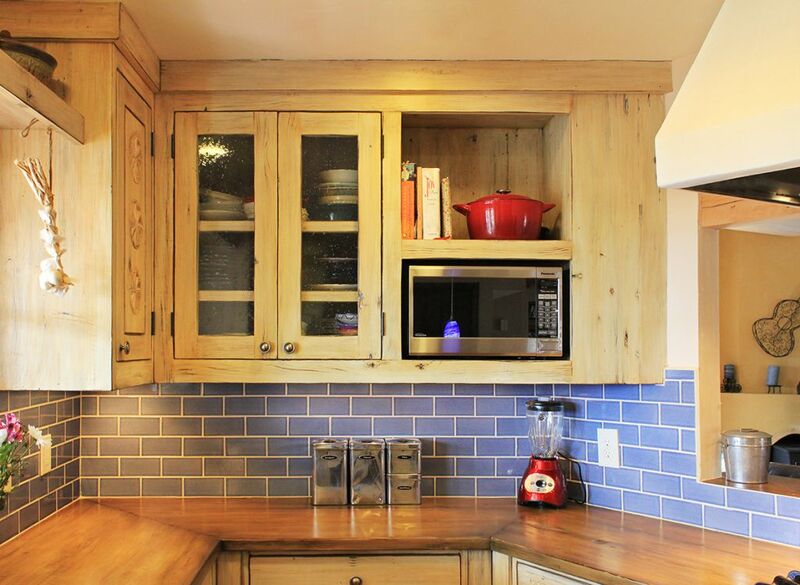 A large panel from a dowry chest was used to adorn the fronts of two cabinets in this kitchen remodel [Fig. 4a]. 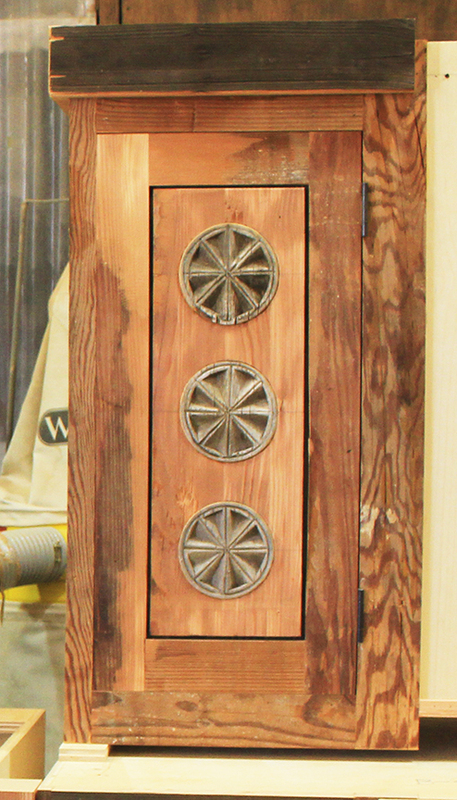 The first has three of the four carved circles embedded in the cabinet door [Figs. 4b-4d], the second contains the central circle [Figs. 4e-4f]. The photos taken in the wood shop highlight the additions with the contrast between the grey, aged wood and cabinet door fronts newly milled from salvaged barn wood. 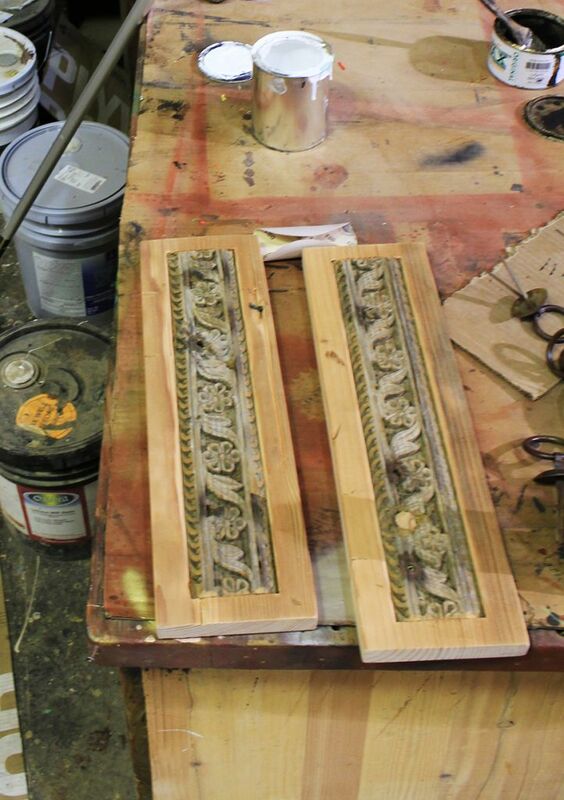 Intricately carved floral panels from an antique door surround were set into some of the drawer fronts. 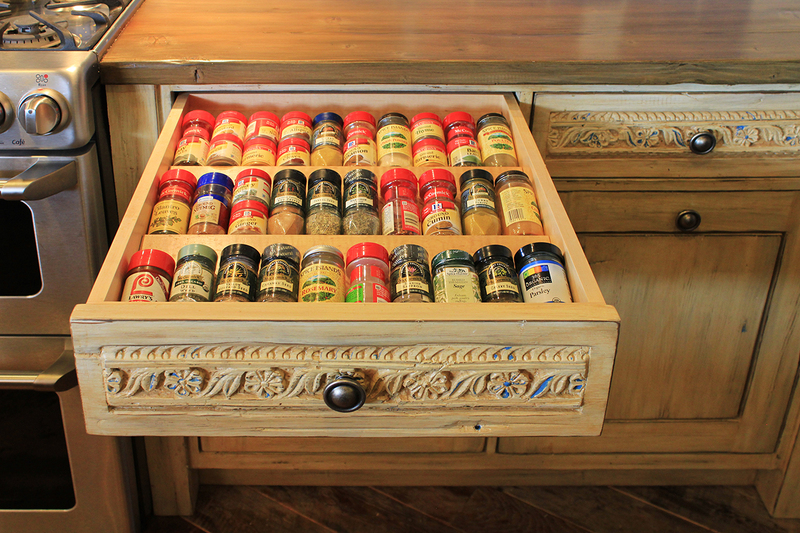 This drawer features a spice rack insert [Figs. 5a-5b]. The cabinets at the end of the kitchen feature artisan bubble glass in the doors, an open shelf for cookbooks and a cubby for the microwave. Particularly when compared with the before photo, one can see how this contributes to the feeling of openness achieved with the windows [Fig. 6b]. 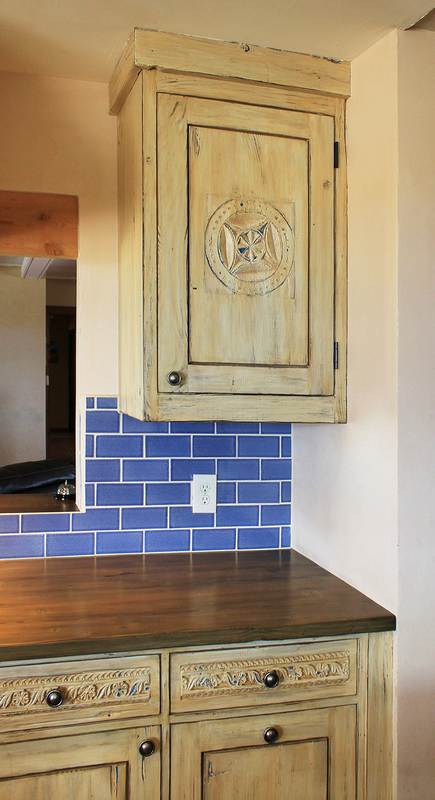 The completed kitchen remodel [Figs. 7] features a number of customized cabinets and drawers, from a tall cabinet to the left of the fridge for mops and brooms to a drawer knife insert. When considering a remodel or new build kitchen, it pays to do your homework – to study how you use the kitchen. You want the things you use the most to be right at hand, while the things you rarely use can be higher and more out of reach. Maybe you need the kitchen to work better with more than one person doing prep and cooking, or an out-of-the-way nook for a dog bed or feeding station. 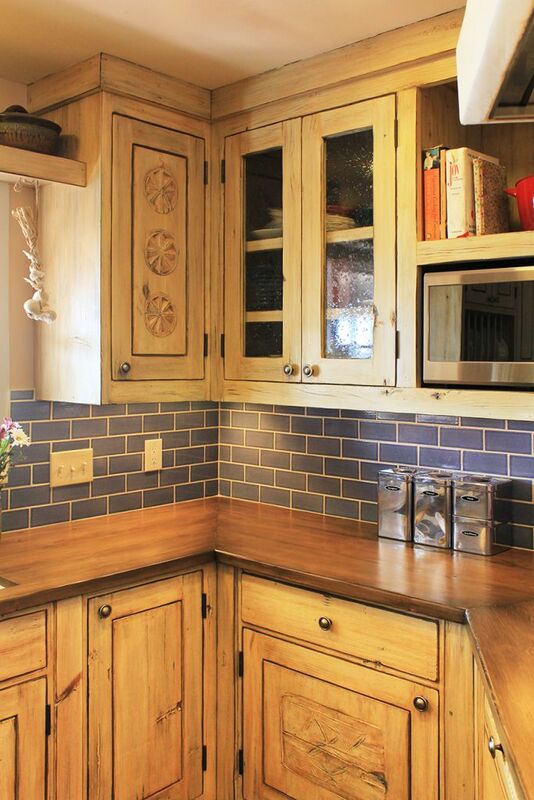 If you are a person who hates clutter or things on the counter, an appliance garage can be just the thing. 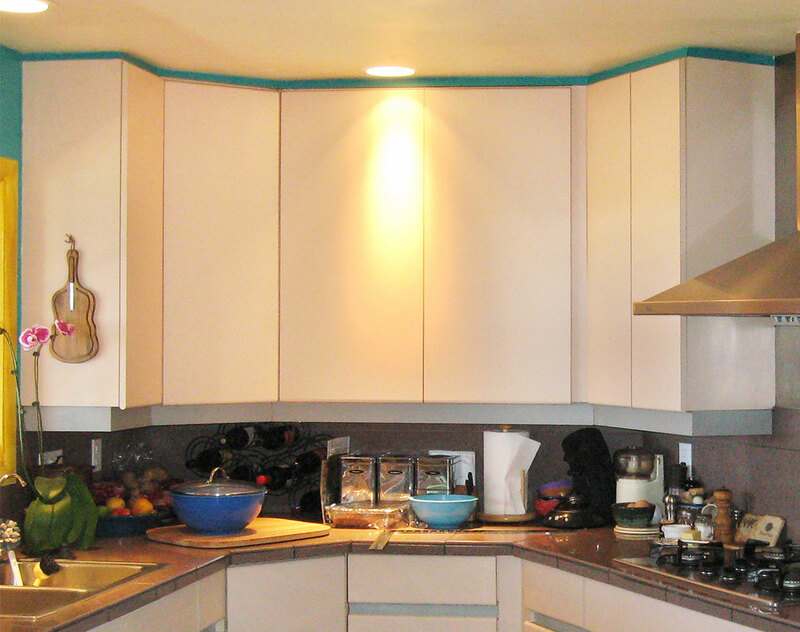 Customization can be expensive, but if you know how you use your kitchen and do the customization accordingly, it is worth every penny and then some. Our clients did their homework and chose to have the spice rack drawer to the right of the stove, a mixer lift in the cabinet next to a wide work countertop, a lazy Susan insert that makes the most of recessed corner cabinets, pull-out shelves to make even the back of the cabinet accessible, the microwave is up off the countertop, a recycling tub that pulls out when the cabinet door is opened and drawer dividers to keep that dreaded “junk drawer” at bay. The tools they use are within easy reach, the dishes are now near the dishwasher, the pots and pans near the stove. The couple loves the new kitchen and they say with the extra work space both can comfortably work in the kitchen, or, with the new window, talk to someone who is in the living room – they don’t feel so cut off. With a little bit of thought and planning, a kitchen remodel can make your kitchen a joy to use.